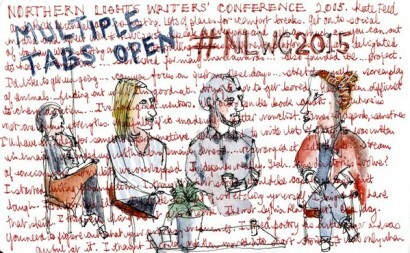 In its third year at the Waterside Arts Centre in Sale, the Northern Lights Writers’ Conference continues to attract a good crowd of writers with different levels of experience and background. With a mix of keynote speech, panel discussions and thematic workshops, the conference has hit upon a winning formula, which gets tweaked a little each year. If A.L. Kennedy two years ago was inspirational about why we write, and Will Self last year lived up to his patrician persona, Louise Doughty came across like the literary professional that she is – seven novels and regular appearances on Radio 4 into her career – and did a good job in weaving her personal story with some sage advice. However, that was to come. The first session was a fascinating panel, looking at storytelling across different platforms, chaired by MLF’s Kate Feld. It was about the modern writer’s “portfolio career” – keeping all the balls in the air, from multiple projects at different stages, whilst trying to stay true to the writing. It was a theme that we would come back to – that if our dream is to become a full time or professional writer, then we have to think about what that means – even the very best and most successful become their own accountants, marketing officers and tour managers! Emma Jane Unsworth, James Varney and Kerry Hudson compared their very different experience of working in different genres . Rewriting her novel Animals as a screenplay made Unsworth consider what she was precious about as a writer – she wanted to keep in the jokes, whilst she was far more amenable to structural changes which would help the book transition into a movie. Varney, who has primarily written for performance, felt like he had several tabs open in his writing life, and could shift between them. When collaborating with a poet on a performance piece, the work evolved out of their workshops and changed direction as a result, whilst other times he’d sat down with a clearer idea of what he was planning. Hudson, who would talk more about her own professional life later in the day, thought voice was key, as the character in her first novel had first appeared in a short story. It was also interesting to hear about The Writing Squad, an initiative in the North for younger writers with potential, which had helped Varney, and of WoMentoring, a mentoring project for women writers Hudson established. Louise Doughty is one of those names I was aware of from the bookshop, but had never read. A professional writer for best part of 20 years, she said that in some ways she felt she was more a writer in the decade before that, signing her first contract at the end of her twenties. From a working class background in Yorkshire, she decided post- university, to write full time, and was very candid about both her conviction to be doing that, and the nature of the work that she wrote. Moving to London in the 80s when it was still feasible to have a temporary job, and live there, its sounds like she was on the edges of the literary demi monde of the time – when it was still ageing publishers in wood panelled rooms going for long lunches. Arriving at the Literary Review unannounced, she asked “Bron” (Auberon Waugh) if he had anything she could review and he waved at the wall of books and told her to take something that she fancied – and by the way, “did she play Bridge? We’re one short for a hand.” That world may have (mostly) disappeared, but the path to her first novel was familiar one; and when she finally got published it was because of the unpublishable stuff she’d written up to that point. In a Q&A with Ric Michael after lunch, she expanded on her progress through seven novels to her “breakthrough” book Apple Tree Yard, a courtroom drama that is being adapted for TV by the team behind Broadchurch. Whereas most of her books had come out of longstanding interests or ideas, this came out of nowhere, and became the book she had to write next. I was fascinated by the amount of research she did for her books, with this one seeing her blag her way into a murder trial at the Old Bailey, in order to be meticulous about the background she was about to write. A second panel discussion brought back Kerry Hudson with her agent and her publisher. In her case, the publisher is very much there once the book exists, not before, whilst the agent is involved along the way, reading early drafts and partial chapters. This role of the agent, as literary midwife as well as business partner, is a relatively recent one I think, but seems to be now accepted as standard, and it was stressed how important it was to have the correct fit between agent, author and publisher. We split up for the final session of the day, with sessions on performance, blogging and writing for radio. I attended the last of these, as it was the area I knew least about. Radio drama in the UK has only got one real customer, the BBC, but within that there are a number of different channels that commission work. Yet there is also a small, but active independent sector which responds to pitches from the national broadcaster. The BBC does look out for new writers, via its Writers Room and a bursary scheme, but the medium thrives on ideas as much as finished scripts. So that idea for a documentary, might actually make a drama, or vice versa. There was plenty of space for questions during the day, and without exception the panellists and speakers were generous with their time and knowledge. Writing can be a hobby, a dream, a vocation…. but it can also be a job, a profession, and a day like this, particularly taking place just a tram ride away, was well worth the time away from the computer. Hopefully, after three years, its now well established in our local literary calendar, and I look forward to the next one.